Special features: Haggai was the first of the postexilic prophets. The other two were Zechariah and Malachi. The literary style of this book is simple and direct. August 29, 520 b. c.
Presented a status report of the situation and helped the people see why failure to complete the temple was a problem (Hag. 1:1–11). September 21, 520 b. c.
Reaffirmed the Lord’s commitment to help the people; construction was restarted (Hag. 1:12–15). October 17, 520 b. c.
Reviewed the long-term significance of the project, promising that the new temple would have greater glory than the old; this message brought hope and encouragement to the project team and its leaders (Hag. 2:1–9). December 18, 520 b. c.
Announced that God would start blessing the people again in light of the work being accomplished (Hag. 2:10–19). Presented a message to Zerubbabel concerning God’s plan to “shake heaven and earth, ” and the news that Zerubbabel was chosen as a part of God’s purposes (Hag. 2:20–23). Word in life study Bible . 1997, c1996 (electronic ed.) (Hag 1.15). Nashville: Thomas Nelson. The people of Judah had been exiled to Babylon in 586 B.C., and Jerusalem and the Temple had been destroyed. Under Cyrus, king of Persia, the Jews were allowed to return to Judah and rebuild their Temple. The people returned to Jerusalem to begin rebuilding the Temple, but they hadn't finished. 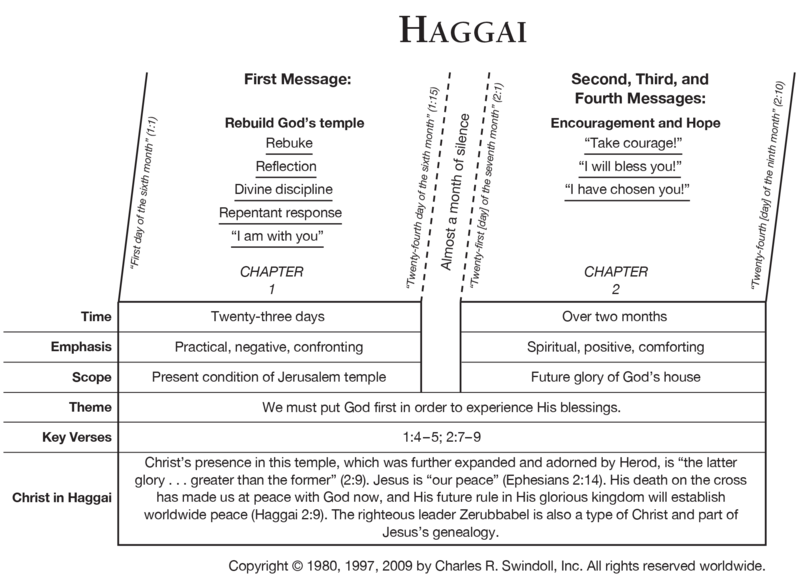 Haggai's message encouraged the people to finish rebuilding God's Temple. The Temple lay half-finished while the people lived in beautiful homes. Haggai warned them against putting their possessions and jobs ahead of God. We must put God first in our lives. When the exiles first returned from Babylon they set about rebuilding the Temple right away. Although they began the right attitudes, they slipped back into wrong behavior, and the work came to a standstill. We need to be on guard to keep our priorities straight. Remain active in your service to God and continue to put first things first.